As a tournament organizer, my preference for these RTT's is to not play in them. I prefer to organize and report rather than play and I want to keep entry slots open for people not affiliated with our gaming club. This day however we need an extra body or two to fill up slots. Absolute Blue was gracious enough to take on my usual full time organization and judging duties for the tournament. I entered as a participant. This game was a Dawn of War / Annihilation. Joaquin places a tactical squad on the table. I hold everything off and roll on with triple wagons covering triple buggies and then walking lootas and kannons. Joaquin drop pods in a Dreadnaught and Immobilizes the Nob Wagon. I put Loota and Kannon fire into his Whirlwind and the Drop Pod on turn 2 and destroy them. My other Wagons survive shots from missiles with cover saves and get to the center of the table. He outflanks with his Land Speeder and Scouts and wipes my Kannon unit. All my Lootas retaliate and kill both units. I try to ignore the Land Raider and put shots into the rest of his units. I Deffrolla his Vindicator to death, I blow up a Rhino with Lootas. I eventually wipe his Tac Squad with Shoota shots. I try to Deffrolla his Land Raider and fail. He wipes all 3 of my buggies eventually but when all is settled I've caused more carnage. The game ends on turn 6. Result: Orks win 7 kill points to 5. This game was Pitched / Capture Control. I sometimes am tempted to go opposite corner on objectives in this game, but this time I put my objective straight across from his in the near corner and try to play for the win. I defer to him and he moves forward with his 2 Daemon Princes. He does not deep strike with his obliterators, but does with his terminators and just takes shots at my wagons but rolls poorly and doesn't do anything with lascannon fire. He gets a bit too aggressive with his Daemon Princes however. On my first turn of shooting I shoot one to death with Kannonz and Lootas and then wipe the other one with a Nob mob charge from a battlewagon. After he loses his DP's I surge forward with two of my wagons getting cover fire from my Lootas. I keep one Wagon back sitting in the corner on my objective. His terminators show up in my back field and fail to harm my Battlewagon with Melta shots. The bad scatter from the deepstrike put him outside of 6" making the shot less than optimal. I kill off two of them with shoota spam from the wagon platform at the bottom of the turn but he still manages to wipe a kannon unit and a couple lootas with the lone terminator before I can finish it off. Meanwhile near his objective I try crashing everything I have on top of his objective. I've wrecked all 3 rhinos with my shooting but he's turtled up behind the rhino wall with all of his troops and obliterators. I attempt to deffrolla his lines. One he death or glories. The Nob wagon gets back there. The remaining boys that fell out of the DOG'd wagon assault his marines. The remaining buggies contest his objective. He can't kill everything on the objective before the game is over. My list isn't really optimized for the 5 objective seize game. This deployment is spearhead. I pay for it here with only three scoring units. Shep's list is difficult for me to defeat because my lootas, usually all-stars again light mech transports, are terrible against his list. I do have Rockitts and Kannonz however. I have absolutely no reliable answer to Tyrannofexes though short of a full nob assault. 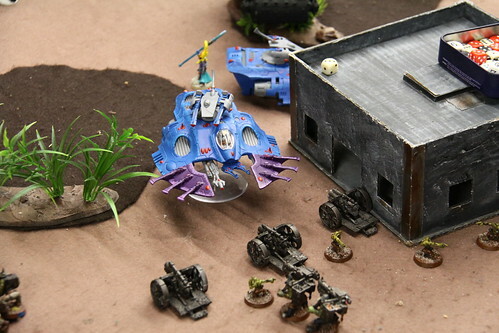 Shep fans out his army putting some gaunts and a tervigon into the left, center, and right portions of the battlefield in an effort to swarm objectives. A Tyrannofex blows up the Nob wagon right off the bat. My remaining transports surge forward split to each side. The Buggies take shots at his tervigons with limited success. The Lootas basically have one target: Hive guard, whom I shoot and manage to kill almost all of over the course of the game. The Nobs run to the closest objective and end up assaulting an killing a Tyrannofex. Another wagon is blown up and the boyz that spill out clean up some gaunts. My other boy unit shoots gaunts in the corner but tries to keep distance from a closing Tyrannofex. As the game wears on it's becoming obvious I'm not going to win. The swarms of endless gaunts eat my boys. My nobs are contesting the objective and I end up killing a tervigon and a bunch of gaunts in the ensuing explosion but there are still 2 tervigons on the board and far too many gaunts camped on objectives to kill them all in time. I manage to contest one objective with a crippled buggy. I am able to wipe another gaunt unit of the far side objective but cannot score it because a Tyrannofex is sitting there as well. I can't even score my home objective. I don't have enough troops. I did some damage to his army but simply don't have the numbers to score enough objectives. He crippled my mobility and killed a troop. I couldn't get to his home objective and couldn't score my own without conceding some mid-field. Result: Tyranids win 1 Objective to 0. The final round is pitched battle / annihilation. 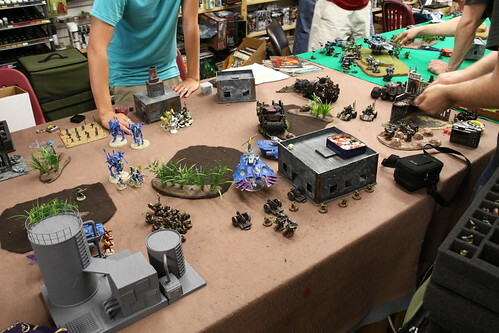 David is playing a hybrid eldar list with both monstrous creatures and wave serpents. I win the roll and am on the play, I loota spam his warwalkers a blow up two and weapon destroy the third. I put kannon fire into his wraithlord, move my wagon on the left side 7" and then put shoota shots into nearby infiltrating snipers and move my other wagons and buggies 12-13" into the center of the table. He responds by turbo-boosting his wave serpents and positions melta shots into my wagon. He kills a buggy with my failed KFF cover save. I debark my wagon with the nobs to assault the wounded wraithlord but end up just killing it with rockitt buggies instead. I then deffrolla an avatar, and put a full kannon barrage into it to finish it off. My lootas pepper shots at wave serpents but don't get any exciting results on the damage table. He meltas a wagon and then bladestorms the boyz that fall out. They manage to survive with cover saves. My remaining boyz in a wagon finish off his guardians. My nobz then assault his howling banshees. I put more lootas and rockitt buggies into his wave serpents and finally wreck them. I finish off the lame warwalker and fire dragon unit. The game ends on turn 5. Orks win 8 kill points to 2. So those are my tourney results. A 3-1 record and I lost to Shep, who ended up winning the tourney. Good enough for second place. I'm pleased with my list for the most part but I think I'll try to find some points for a fourth troop, either a small boy unit or grots so that I have more flexibility in the seize games. Orks can do well if they have enough strength 7 and strength 8 shooting to suppress enemy fire. This enables the mobile units to get wherever they need to go in one piece. In all the games I won, the deffrollas got to ram things. In the game I lost, they never made it. 0 Response to "Batrep: Sprue Posse RTT 6/5 Tourney Report - Kevin Nash's Orks"